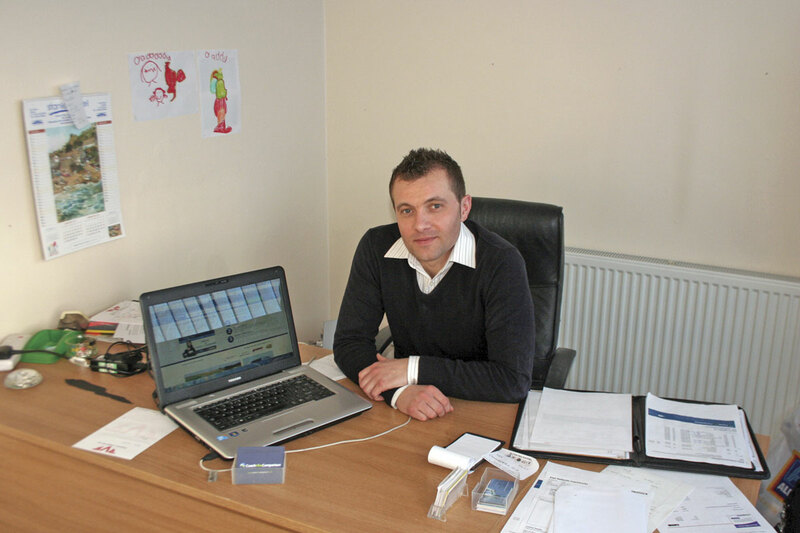 When Chris Peat first visited the Castle Donington base of Coach Hire Comparison last year, he found a business that was making strides in enhancing online coach hire. The man behind the website, James Stokes, was bringing a fresh approach to gaining bookings, bringing the bus and coach industry well and truly into the digital age. Not only was this helping its own service, it was also aiding its clients’ business, the operators listed on the site. It was clear James was passionate about what he was offering. Not only this, but with prior experience as an operator, he has the valuable knowledge and insight into how his customers do things. Demonstrating his new quotations system, James said it was all intended to improve the customer experience and increase business for clients signed up to the site. 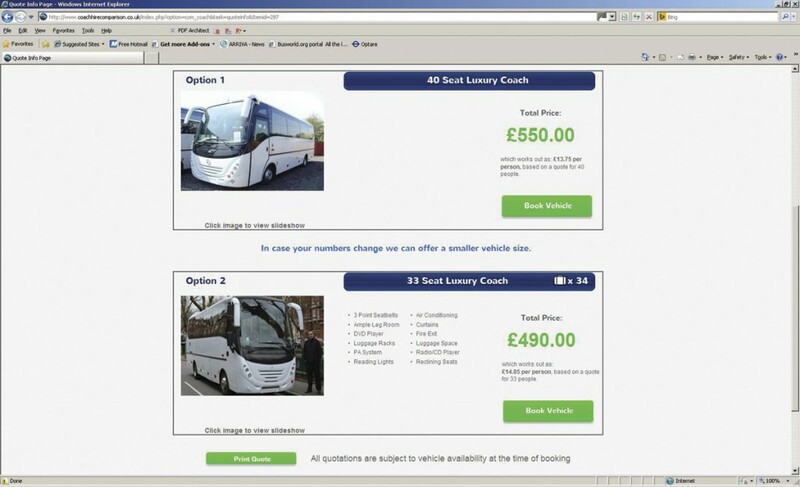 Previously, quotations e-mailed to users of the website only included details of the job being quoted for (destination, date, start location, etc), along with the price, a quote reference number, operator contact details and a very brief description of the vehicle (49-seater executive, for example). The new system has all of this information and more. One of the major and most noticeable improvements is the introduction of pictures of the vehicle being offered to carry the quoted work out. James said this is intended to provide more assurance to potential customers, letting them know what the vehicle that will turn up on the day will actually look like. Up to four photographs per coach can be uploaded. Users can click the image and view these shots of the vehicle, showing it at different angles or perhaps displaying the interior. Which images are used is the operator’s decision and new ones can be added whenever required, as can any information that needs adding. This is all done through the members’ area. In addition to this, the new quotations offer at least one other option, showing another vehicle for the job. It could have different features and perhaps a different seating arrangement in case the number of passengers changes. It could also be of a higher specification than the first one listed, with the customer made aware of this by all its features mentioned. This, James said, may tempt potential customers to go for an executive coach rather than standard. Customers do not necessarily go for the cheapest option, according to James. He believes this will particularly be the case when there is an image of the vehicle, encouraging hirers to go for the more up-market option. In addition to the new look quotations, the site also has reviews of the quoting operator sent in by past customers who have previously used the site and hired that particular company. The latest review is displayed on the e-mail with the quotation. Each operator signed up to the site has a page on the Coach Hire Comparison website, displaying their review comments. Again, this gives peace of mind to those looking to hire coach travel, providing them reassurance the operator will do a good job. Something else positive to note about the quotations was the speed at which they are sent out. They can be automated, with the website connecting with an operator’s fleet management system to allocate a vehicle for the requested job. Doing this speeds the process up. When the system was demonstrated to me, I received two quotes within five minutes of making a mock enquiry. James said the London area is especially quick in getting quotations out. This speedy response time helps with conversion rates, according to James. To highlight this speed, the quotation e-mail sent out also gives the response time of the quotation. Offering this style of quotation is unique to Coach Hire Comparison, according to James and the additional feature has now gone live. Prior to it being introduced it was tested with a number of different coach operators. James said it has ‘gone down well’, with a lot of extra conversions from quotations to actual bookings through it. ‘Customers can see it’s different. It is set to revolutionise how customers see their quotations. This is the standard for us now, this is what all of the operators signed up to the site benefit from,’ said James. Customers can see it’s different. It is set to revolutionise how customers see their quotations. This is the standard for us now, this is what all of the operators signed up to the site benefit from. It is great to see someone so enthused about improving online facilities to benefit operations and attract even more passengers onboard, especially when their efforts seem to be paying off. James is not happy to leave it there though, he is constantly looking for ways to improve. He said there are a number of developments that he plans to announce in the near future.